The U.S. Superfund Amendments and Reauthorization Act, SARA is an amendment and reauthorization of CERCLA, the Comprehensive Environmental Response, Compensation & Liability Act (CERCLA) of 1980, better known as the SuperFund Act. Both CERCLA and SARA have the goals of identifying, remediating and preventing the release of hazardous substances to the environment. Get Title 40 of the US Federal Code, Environmental Protection, in searchable hypertext PDF format on CD-ROM from Safety Emporium. SARA not only extended the life of CERCLA, but made several important changes to provide new tools for enforcement, remedies, funding, and both state and individual input. SARA also resulted in a revision of the U.S. EPA's (Environmental Protection Agency ) Hazard Ranking System to assess the degree of hazard to humans and the environment. The Emergency Planning and Community Right-To-Know Act (EPCRA), also known as the Community Right-To-Know Law, is also known as Title III of SARA. this provides specific plans for preparing for, preventing, and responding to the release of over 600 chemicals listed in the Toxics Release Inventory. In 2002, the Bush administration decided to shift the funding of SARA from the chemical and petroleum industries to the taxpayers. On December 30, 2009, the US EPA issued an Advanced Notice of Proposed Rulemaking concerning Superfund financial responsibility which would require that classes of facilities maintain financial responsibility consistent with the degree and duration of risk associated with the production, transportation, treatment, storage or disposal of hazardous substances. While not restoring the old funding mechanism, this proposed rule would reduce the likelihood of a major hazardous materials operator going bankrupt and leaving taxpayers to pay for the cleanup. We'll post further updates on the rulemaking process as it evolves. "CERCLA - Comprehensive Environmental Response, Compensation, and Liability Act (Superfund), Second Edition: Basic Practice Series", Paperback, 158 pages, 2009. Estimated price $51.06. Info and/or order. "Amending CERCLA: The Post-SARA Amendments to the Comprehensive Environmental Response, Compensation, and Liability Act", Paperback, 665 pages, 2007. Estimated price $149.95. Info and/or order. "Commercial Landowner CERCLA Liability Protection: Understanding the Final EPA 'All Appropriate Inquiries' Rule and Revised ASTM Phase I", Paperback, 136 pages, 2006. Estimated price $43.00. Info and/or order. MSDS's may mention SARA for certain materials. Any release of one or more of the roughly 800 CERCLA or 360 EPCRA hazardous substances that equals or exceeds a reportable quantity (RQ) must be reported to the National Response Center (NRC). 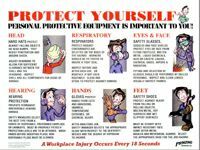 Get PPE posters and more at Safety Emporium. An overview of SARA at the U.S. Environmental Protection Agency. View the full text of SARA by consulting Title 42, Chapter 116 of the U.S. Federal Code. Download the Reportable Quantities discussed in detail at the US EPA. See also: ATSDR, CERCLA, EPCRA, RCRA, TRI.